I got this recipe out of Mother Earth News a long time ago ... around 1980. Wow, I just now found it on their website: Simple Bread. Here is a PDF copy in case the web page goes away. We started making it again recently and like to make a smaller batch and make it fresh each time for breakfast burritos. We have been leaving out the soy flour but plan to try it with soy flour next time we get to the coop to buy some. For now, we have modifed the recipe as follows. Feel free to experiment and adjust flour and water quantities to get desired consistency. Not too wet, not too dry, according to what you like. Put the dry ingredients in a large bowl and stir to mix. Add the water to the dry ingredients and mix so that all the flour is moisened (you'll probably need to use your hands). Put on floured board or kitchen counter and squeeze/knead a minute or two till it is a little springy. Pull off enough dough to make a ball about the size of a ping pong ball, or bigger if you want bigger tortillas. Shape into a nice ball. 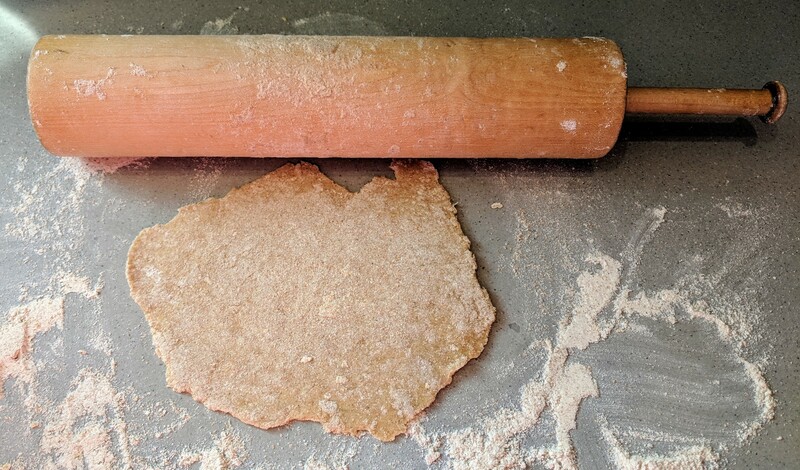 Roll flat and thin with a rolling pin. As you do this, sprinkle flour on board and dough to keep from sticking. Place on hot dry griddle or frying pan. Cook until it starts to brown in spots. It won't take long. It will probably bubble up a little as well.